….Winter Rates (Cooked Breakfast included)..冬季料金（朝食付き）..冬季价格（包括熟食早餐）…. ….¥7,500/¥11,500 per adult per night - Winter low/peak (Double occupancy)..2人部屋；１泊１名¥7,500〜¥11,500..¥7,500 /¥11,500每位成人每晚 - 冬季低/高峰（双人入住）…. ….¥12,500/¥23,000 per adult per night - Winter low/peak (Single occupancy)..1人部屋；１泊¥12,500〜¥23,000..¥12,500 /¥23,000每位成人每晚 - 冬季低/高峰（单人入住）…. ….Summer Rates (Cooked Breakfast included)..夏期料金（朝食付き）..夏季价格（包括熟食早餐）…. ….¥6,500 per adult per night - Summer (Double occupancy)..２人部屋；１泊１名¥6,500..每位成人每晚¥6,500 - 夏季（双人入住）…. ….¥10,500 per adult per night - Summer (Single occupancy)..１人部屋；1泊¥10,500..每位成人每晚¥10,500 - 夏季（单人入住）…. …. *70% of adult rates per child (12 or younger) per night..*子供1人（12歳以下）1泊あたり大人料金の70％..*每名儿童（12岁或以下）每晚成人价格的70％…. ….Family room - 6 guests (1)..ファミリールーム - 6名用（1）..家庭间 - 6位客人（1）…. 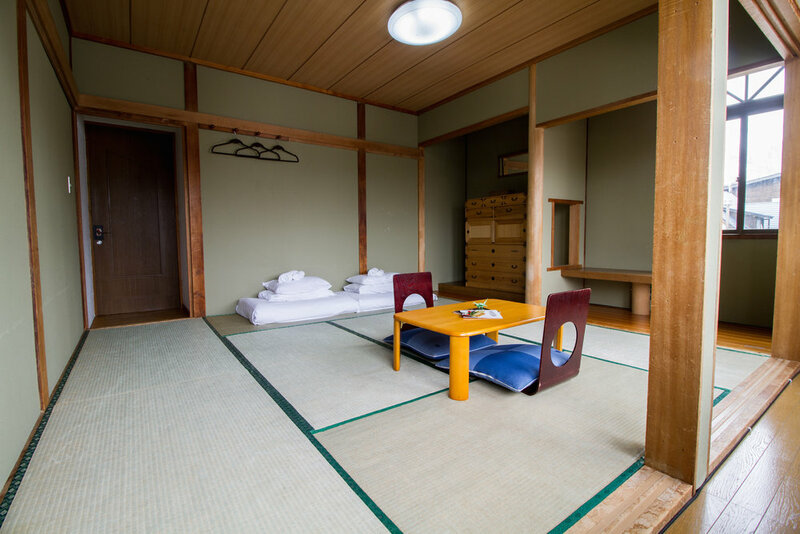 ….Japanese style tatami room (1)..和室（畳）（1）..日式榻榻米房（1）…. ….All rooms are equipped with TV..全室テレビ付き..所有客房均配有电视…. ….Check out Half Note downstairs for a great selection of food..ロッジと同じ建物内にHalf Noteカフェ＆バーがあります。..您可以在楼下的Half Note购买各种美食…. ….Check In / Check Out..チェックインチェックアウト..入住/退房…. ….Bar - Cafe - Live Music..Bar - Cafe - ライブミュージック..酒吧 - 咖啡厅 - 现场音乐….